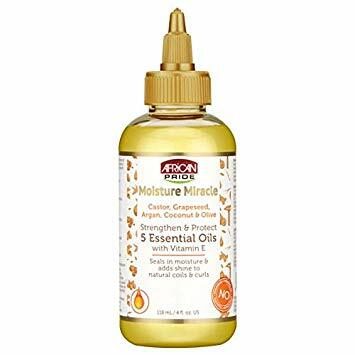 A restorative hair and scalp oil uses a nourishing blend of 5 essential oils(Castor,Grapeseed, Argan,Coconut & Olive) and Vitamin E to replenish natural nutrients, help protect against breakage and promote natural growth; leaving coils and curls with body and shine. DIRECTIONS: Apply a small amount to wet or dry hair. Massage into scalp and work from roots to ends. Also, perfect for hot oil treatments and finishing natural styles. Good for 12 months once opened.